Help! A Puff Adder bit the dog! And how we caught the snake. Help! A Snake bit the Dog! is a phrase that definitely applies to the events of a morning last week. I was having breakfast with the boys when Gloria came to the house. Gloria works for our next-door neighbors. She told me one of the dogs was sick and she thought a snake might have bitten him. Gloria was home alone, with our neighbors without signal deep in the bush, so I rushed over to have a look. “Ay, my boy… Don’t you know you need to leave snakes alone?” I asked the poor dog as I was driving on the N4 towards Malelane. I am sure I could hear him sigh…He was not looking good at all and rested his head on Gloria’s lap. Neither Gloria nor myself had seen a snake, but we thought Bismark might have been bitten by a Puff Adder. They rely on camouflage and rather stay hidden then flee, even when harassed by a dog. I had phoned ahead and let the vet know we were coming in with a possible snakebite. They kindly opened the practice earlier to help this poor little doggy. The vet had a look at Bismarks wounds while I was desperately trying to get hold of our neighbor. We eventually left Bismark in the capable hands of the vet, who would administer an anti-venom. Gloria and I took the boys home. We needed to find the snake before someone else got hurt. After we got back I locked the boys inside the house and met Gloria at the shrub in question. I took my go-to tool in situations like this: my trusted broom. (Read: Toughen up Cupcake – From City Girl to Bushveld Mom.) Gloria armed herself with a long rod. Very carefully, we started searching in the dense vegetation. “There it is!” Gloria shouted! And she was pointing at what just looked like grass and twigs to me. I had to look about 6 times before I finally saw a yellowish streak in the undergrowth. Then I saw the rough scaly dark brown skin of what indeed appeared to be a Puff Adder. Right. A venomous snake in the garden and two boys desperate to come and play outside and see what the commotion is all about. I could hear Alex calling me from inside the house. I quickly phoned the Berg en Dal duty phone. The kind Duty Manager told me she would send someone to come and catch the Puff adder. Not even ten minutes later, our Knight in Shining Armour, Danie, arrived. Danie is an Honorary Ranger and he was in the Duty Managers office, discussing a course when I phoned. Last year, Danie gave the snake-handling course for rangers and guides here in Kruger, so I could not have asked for a better person to come and help with the Puff adder in the garden. Much to the boys’ dismay, I locked them inside the house again and showed Danie where we saw the snake. Instead of a sword, our modern day knight brought a snake-handling kit, which consisted of the following things: A see through bucket with air holes and a clamp-shut lid, a snake hook and a long tong. After he eventually located the Puff Adder (mán, these snakes are well camouflaged! ), he had it secured in the tongs in no time. The Adder was not amused. It turned its head and bit the tongs! Danie allowed me to take a few photographs before he safely secured the snake in the bucket. Since Alex and Jack grow up in an environment where snakes are common, I thought this might be a good lesson for them. So I asked Danie if we could quickly show the kids before he released the snake into the veld. I made Danie a cup of lekker Dutch coffee to say thanks and called the boys outside. You can look, but not touch my boys! Gloria said she would watch the boys for half an hour, while I accompanied Danie to release the snake. With the bucket containing the snake on the backseat of his car, we drove into the park. (I could not help but look back every now and then and check if the lid was still shut) Danie found a suitable area on the S114. One or two OSV’s stopped to ask what he was doing, and Danie was more than happy to show their guests the snake and tell them a few things about Puff Adders. On our way back to the Gate, I asked Danie all sorts of questions about his work as an Honorary Ranger for SANParks. The HR’s really do amazing things for the park. And I would love to write an article about all the aspects of being an HR and how people that are interested in the Honorary Rangers can join. I will do so in a future blog! And Bismark? The brave little dog came home from the vet over the weekend. He might lose the sight in one eye and his face and chest are still quite swollen, but it looks like he is going to make it! I hope he learned a valuable lesson: snakes are dangerous! The Puff Adder is widespread over much of South Africa and elsewhere further north into Africa. It is a heavy-bodied snake that relies on its excellent camouflage and is reluctant to move. Much of its life is spent in camouflage mode and recent research has shown that when hiding, the Puff Adder will not hiss or strike when approached, as this would give away its presence. It is an ambush hunter that will coil up into a striking position and await its prey. This can last several days or even weeks. Toads are lured closer with flicking their tongue. Thank you Linda, so interesting. Here in JAN we get them too. Once my husband and I came across one desperately tryi g to cross a road. We parked the car such that it stopped the traffic. Once he got off the tar he was gone in a flash well camouflaged in the grasses. A successful rescue as for sure someone would have driven over him! Awesome, Julia! I do the same for snakes and tortoises alike! What a scary experience. So glad it ended well. What an exciting experience. You have written this so well, and even though you live you the bush, you are always learning something new! Thanks for sharing about the amazing work that the OR do (aren’t they marvelous!) and for including the fact sheet about puff adders. Poor Bismark. Thank you for helping him. I can just imagine Gloria was glad you were there to help her! Poor Bismark, what breed is he? I know just how you feel regarding always being home alone when snakes are around. I lived outside Pretoria to the North close to Hammanskraal on the Military Base there and it is rural and in the Bush as well. Every time I was home alone I had run ins with snakes. Once a baby Puff adder on the grass, then a rinkhals, then one day a very big very bad tempered puff adder which I actually caught with snake catcher tongs! That one was almost a meter long. Danie is the BEST, he was/is my Mentor in the SHR’s. This means that for every new Applicant you get a mentor that is there to assist you in learning the ropes and answer questions. I am already a Full Member but still ask him for advice. It is absolutely Wonderful being a SANParks Honorary Ranger. Its hard work and as we are Volunteers it does take its toll on your pocket and time, but its worth it. There are so many areas where we can contribute and be part of conservation its fantastic. I love doing it and being a SHR! I think I should get myself a snake-handling kit. And attend one of Danie’s courses. Would love it! Although I am not sure if I would have the nerve to handle a mamba or a cobra. I would love to talk to you about the HR thing. I want to dedicate a blog about the HR’s and need to do some research beforehand. Danie gave me some papers about the intro course, but love to hear some more if you can spare a moment after your bday celebrations? My word, your life is seldom quiet! What an exciting and interesting experience, although probably not so for poor Bismark – I’m so glad he survived. Thanks for including all the pics , together with your vivid text they provided education as well as excitement. It’s so great that you bring the boys up to understand the safe and unsafe interactions in the bush right from a young age; that sneaky little finger – I had to laugh, such a typical testing reaction! As always, thanks so much for sharing your life in Kruger, I love every episode. Julia Nicholson mentions JAN and, intriguingly, gives no indication or what or where that is…piqued my interest no end! (quizzy, I know I am). The comment that fatalities are rare is interesting because from previous reading and some bushcraft learned I was always under the impression that puffadder bites can be fatal if a good bite happens and medical attention is not received quickly. Further, I always believed that a healthy adult has a good chance of surviving but small children, the elderly and those with a weak constitution are at risk from these, and other, snakebites. I would be interested to hear more from the frontline. 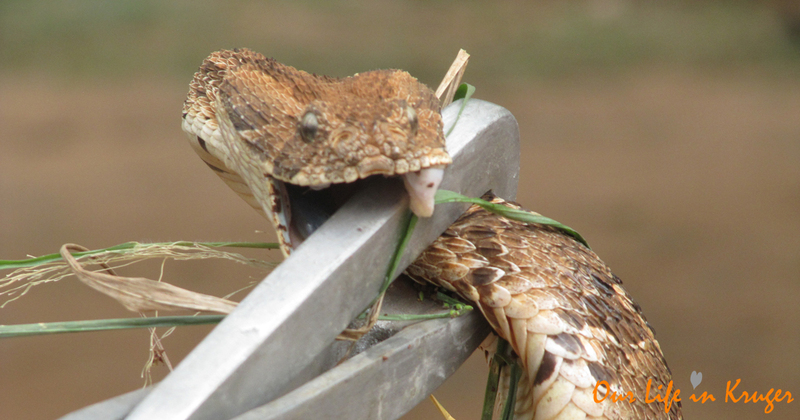 In Australia there is a great deal of snakebite awareness and excellent advice is circulated on the correct procedures to follow if bitten, such as immobilisation, wrapping and so forth. Every year in summer the awareness campaigns are pushed out quite a few times. They have some scarily venomous snakes here and I am grateful that I have not had a run-in with one to date!! We should have awareness campaigns like that in SA!! Not just to teach people what to do when they are bitten, but also that it is not necessary to kill snakes! I will see if I can find some more info about Puff Adder bites and fatalities. I know when Kuki Gallman’s (I dreamed of Africa) son got bitten twice by a Puff Adder. He did not survive his second bite. An interesting episode, well written. Happy to read that the boys and you and Gloria were not harmed, and I hope little Bismark will recover enough to lead a normal life again. Danie sounds like a treasure. Having lived all my life in Africa, and quite a lot of it in the bush, I know how dangerous puffies can be, and so difficult to spot. What an interesting life you lead. Such a good idea to capture it all in your blogs – your kids will love reading all about it one day when they are grown. Hi Janet! Yes, you hit the nail on the head there! That is the main reason why I started blogging! Just so happy that there are other people out there that love to hear our stories too! Danie is an absolute treasure. I would love to do a snake handling course with him one day! Sorry about the dog, but glad it wasn’t the boys who found Puffie! Equally happy the snake was relocated safely to Kruger. Love these posts!!!! Flip ja, imagine that! Both Boys were very curious about the snake. Alex a bit more so than Jack, but I really hope we can stay snake bite free in our house! Educational and interesting. Yes please tell us more about honorary ranger’s day in “work”. I am really interested how Park is functioning. There is plenty of people doing variety of jobs to make it happened. Starting with cleaning stuff and ending with rangers and management. Recently I have heard about giraffe stuck in the middle of river. I wonder if park is going to rescue it or just leave alone. It is interesting how this kind of decisions are made. I will do a bit of research and chat a bit more to a few Honorary Rangers, as research for an article. But I definitely want to write about them! Maybe a series of articles about different jobs in the park? Mmmm. Yes, that giraffe is stuck on an island. I can only assume the river came up some quickly it did not have enough time to leave. The Crocodile River also came up a lot. It is slowly subsiding so I can imagine the Olifants is doing the same. Then the giraffe can walk off. Not sure if SANParks will intervene, but also keeping a close watch on social media to see what is happening. The problem is that giraffe do not take to anesthetic very well. If they decide to take it off the island, they would most likely have to dart it from the air, which might spook the giraffe. The stress of the capture alone might kill it. So it is not a decision that is easily made. Well done on handling the situation so well Linda and to Danie for his help in catching it and releasing it safely. Hope Bismark will make a full recovery soon. This was a wonderfully written and interesting story. We have been on 8 safaris, but never tonKtuger (there is still time, right) and have seen few snakes. But one day on a game ride in Zambia out driver stopped to show us a puff adder nicely camouflaged at the base of a tree. I do like snakes, but would never pick one up. I also loved your article about Marla fruit. From the first time I tried Amarula as a sundowner, I was hooked! Next visit I will have to look for marula jelly. Hi Carol! You are not going to regret a safari to Kruger, I promise! Having a glass of Amarula while sitting around a campfire in one of Kruger’s rest camps… there is nothing better than that!